Ngaio Marsh on BBC Radio 7. I missed yesterday's broadcast on BBC Radio 7 of Ngaio Marsh's A Surfeit of Lampreys (with Jeremy Clyde as Roderick Alleyn), but you can listen again here. Coming up on Monday on BBC Radio 7: The Mystery of a Hansom Cab by Fergus Hume (1886). British ghost story writer and anthologist R. Chetwynd-Hayes was born today in Middlesex, England, in 1919. Recipient of a lifetime achievement award from the Horror Writers Association, Chetwynd-Hayes wrote, among many other works, "Housebound" (adapted by Rod Serling as "Something in the Woodwork," Night Gallery, 1973), The Monster Club (1975; film 1980), and The Psychic Detective (1993). He died in 2001. Happy birthday, G. K. Chesterton; T. H. White. Father Brown creator and all-around man of letters Gilbert Keith Chesterton (seen at left) was born today in London in 1874. The Library of Congress has an online exhibit of photographs from the Chicago Daily News, including a fetching image of Chesterton at a Chicago train station in 1921. 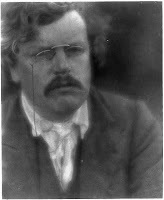 The 27th annual Chesterton conference in June will focus on his work Orthodoxy (1908). And T. H. White, best known for The Once and Future King, was born today in Bombay, India, in 1906. White also wrote a little-known detective novel, Darkness at Pemberley (1932; rpt. 1978). Emmy-winning composer Earle Hagen, whose themes for TV shows include I Spy and The Mod Squad, has died at age 88. His "Harlem Nocturne" was also used as the theme for Mickey Spillane's Mike Hammer. Here are some comments by Hagen on his music for I Spy and an Archive of American Television interview with Hagen in 1997. Harvard Acquires James Gould Cozzens Materials. The blog of Harvard's Houghton Library Modern Books and Manuscripts reports on its acquisition of materials relating to author James Gould Cozzens (1903-78). Cozzens won the Pulitzer Prize for his World War II book Guard of Honor (1948), and his legal novel The Just and the Unjust (1942) appears on the Haycraft-Queen Cornerstone list. The Old Bailey Goes Online. Proceedings of nearly 200,000 trials at the Old Bailey, the main criminal court in London, are now available online; they span the years 1674 to 1913. Have a look at the two cases involving suffrage leaders Emmeline Pankhurst, Christabel Pankhurst, Frederick Pethick-Lawrence, and Emmeline Pethick-Lawrence for their actions to "unlawfully and maliciously damage certain property, to wit, glass windows, the property of the liege subjects of our Lord the King" and, in Mrs. Pankhurst's case, "feloniously procuring and inciting a person or persons unknown to commit felony" (May 1912, April 1913). 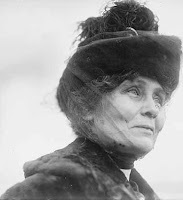 About the photo: Emmeline Pankhurst. Library of Congress, Prints and Photographs Division. Happy birthday to Snoopy inspiration and Dickens pal Edward Bulwer Lytton (1st Baron Lytton), who was born today in 1803. 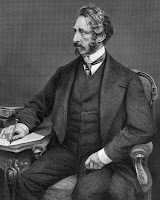 Stay tuned for the Clues issue that features an article on Bulwer Lytton's contribution to crime fiction. And birthday cake also goes to Jason Bourne creator and former actor-producer Robert Ludlum, born today in New York City in 1927. Happy birthday, Mary Willis Walker. An Edgar winner (for The Red Scream, 1994), Anthony winner (for Under the Beetle's Cellar, 1995), and Agatha winner (for Zero at the Bone, 1991), Texas resident Mary Willis Walker was born today in Wisconsin in 1942. An excerpt from The Red Scream appears in Lone Star Sleuths (2007), ed. Bill Cunningham, Steven L. Davis, and Rollo K. Newsom, and published by University of Texas Press (the collection also features Susan Rogers Cooper, Bill Crider, Rick Riordan, and other writers). DC's Museum of Crime & Punishment. The new (and steeply priced) Museum of Crime & Punishment opens today in DC. Here's a column about the museum by the Washington Post's Marc Fisher. The LAPL Dodges a Bullet. It seems that the people of Los Angeles have spoken out against library branch closures, budget cuts, staff layoffs, and additional fees, and the book-buying budget has actually been increased by $2 million. Further details here. Among the LAPL's resources, its marvelous photo collections include, pictured at left, a shot by Cliff Solomon of the exterior of Philip Marlowe's office building, which appeared in Robert Altman's The Long Goodbye (1973). The National Trust for Historic Preservation has declared May to be Preservation Month, and in response, people have been sending in photos and stories about significant places around the United States, including the childhood home of women's suffrage and peace icon Carrie Chapman Catt and Denver's haunted Brown Palace Hotel (pictured at left). "A Study in Scarlet" Nets More Than $30,000. After a UK-US bidding war, Sir Arthur Conan Doyle's "A Study in Scarlet" from Beeton's Christmas Annual (1887) went for 15,500 pounds at an auction of Oxfam books today. More here from the BBC and here from Bonhams. Margery Allingham, creator of mysterious detective Albert Campion and his sidekick Magersfontein Lugg, was born today in Ealing in 1904. Luckily for readers everywhere, Felony and Mayhem Press is reprinting all of the Campion books, including, eventually, The Tiger in the Smoke (1952), selected by the Times of London as one of the Best 100 Mysteries of the twentieth century. I'm partial to her nonfiction work The Oaken Heart (1941), which is a penetrating look at life in an English village with World War II refugees. Clues ran, in the summer 2007 issue, a discussion of Allingham's short stories by B. A. Pike, chairman of the Margery Allingham Society. Here is an interesting discussion of Campion and Allingham from the Times Literary Supplement. 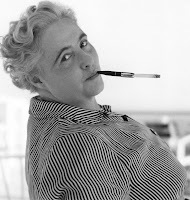 About the photo: Margery Allingham by Philip Youngman Carter. Image courtesy of B. A. Pike, Margery Allingham Society. Edward Everett Tanner III, aka Patrick Dennis and Virginia Rowans, whose Auntie Mame (1955) has sold more than 2 million copies, was born today in Chicago in 1921. An ambulance driver in Europe, North Africa, and the Arabian Peninsula during World War II, he also worked, later in life, as a butler. He died in 1976. Artist Normal Bob Smith has provided a "Librarian Dress Up" page, where you can even transform the librarian into a superhero (although some might argue that the librarian is that already). Happy birthday, L. Frank Baum; Katherine Anne Porter. Pay plenty of attention to the man behind the curtain... Lymon Frank Baum, the creator of the Great and Powerful Oz, was born today near Syracuse, New York, in 1856. And Ship of Fools author Katherine Anne Porter was born today in Indian Creek, Texas, in 1890. Take a virtual tour of the Katherine Anne Porter room at the University of Maryland (she lived in the Washington, DC area before her death in 1980). 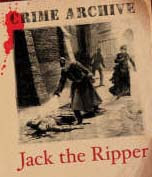 London's Museum in Docklands is holding a new exhibit "Jack the Ripper and the East End" that will run to November 2. Here is a BBC Radio 4 Front Row program about the exhibit (that also includes a discussion of All You Need Is Love, a documentary on popular music). See also the Whitechapel Society. Historian and author Mari Sandoz was born today in Nebraska in 1896. 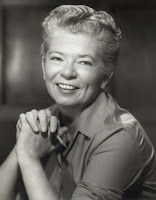 Despite having a father who considered writers "the maggots of society," she wrote six books dealing with the history of the Great Plains (Old Jules, 1935; Crazy Horse: The Strange Man of the Oglalas, 1942; Cheyenne Autumn, 1953; The Buffalo Hunters, 1954; The Cattlemen, 1958; The Beaver Men, 1964) and also warned about the dangers of American fascism (Slogum House, 1937; Capital City, 1939). She died in 1966. The Mount, the beloved Massachusetts home of Edith Wharton, faces possible foreclosure unless sufficient support is received by the end of the month. Read more about it here. Bestselling author, Edgar nominee, and former attorney Jeffery Deaver (aka William Jeffries) was born today in Illinois in 1950. His many novels include Manhattan Is My Beat (1989), The Bone Collector (1997; film 1999), The Sleeping Doll (2007), and the forthcoming The Broken Window (June 2008). The University of Virginia has a new exhibition on display through October, "The Monster among Us: 'Frankenstein' from Mary Shelley to Mel Brooks." Also look at this resource from U-Va, "The Shelleys and Their Circle." The Return of Miss Cayley. A new edition of Miss Cayley's Adventures—written by Grant Allen and introduced by me—is now available from Kansas City's Valancourt Books. It has not been in print since 1902. Miss Lois Cayley, an early female detective, debuted in the Strand in 1898 and appeared in book form in 1899. A model of the New Woman, she travels around the world thwarting con men, solving mysteries, rescuing people in trouble, and scaling mountains with aplomb. The Canadian-born Allen, best known for the controversy surrounding his New Woman novel The Woman Who Did (1895) and his marked influence on H. G. Wells, also wrote sci fi, mystery, and paranormal works that include An African Millionaire, "The Great Ruby Robbery," "Palinghurst Barrow," and What's Bred in the Bone. His friend and neighbor Arthur Conan Doyle completed Hilda Wade, Allen's work featuring another female detective, per Allen's deathbed request. Allen died in October 1899. 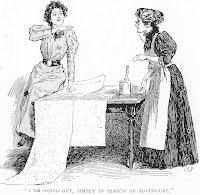 As I am very concerned with mystery history, particularly the scarcity of affordable works featuring nineteenth- and early-twentieth- century female detectives, I was eager to see Miss Cayley's Adventures back in print. I'm glad it's now part of Valancourt's offerings of 1890s fiction. About the illustration: "I am going out, simply in search of adventure." Illustration by Gordon Browne for Miss Cayley's Adventures, by Grant Allen. New York: Putnam, 1899. Introd. Elizabeth Foxwell. Kansas City: Valancourt, 2008. Here's an interesting NY Times article on Minneapolis' Open Book, which is a nexus of arts and literary organizations, including the Loft Literary Center. What it doesn't tell you about are the mystery authors who have taught at Loft: Lambda winner Ellen Hart and Agatha nominee Erin Hart (no relation). Suspense master Charlotte Armstrong was born today in Michigan in 1905. An Edgar winner for Best Novel for A Dram of Poison (1956)---a particular favorite of Anthony Boucher---Armstrong wrote a number of fine novels, including the Macdougal Duff series (Lay on, MacDuff!, 1942; The Case of the Weird Sisters, 1943; The Innocent Flower, 1945), The Chocolate Cobweb (1948), The Balloon Man (1968), and The Unsuspected (1946; an entry on the Haycraft-Queen Cornerstone list). She died in 1969. Author Jan Burke, in an appreciation for Clues, dubbed Armstrong's work "suburban noir."